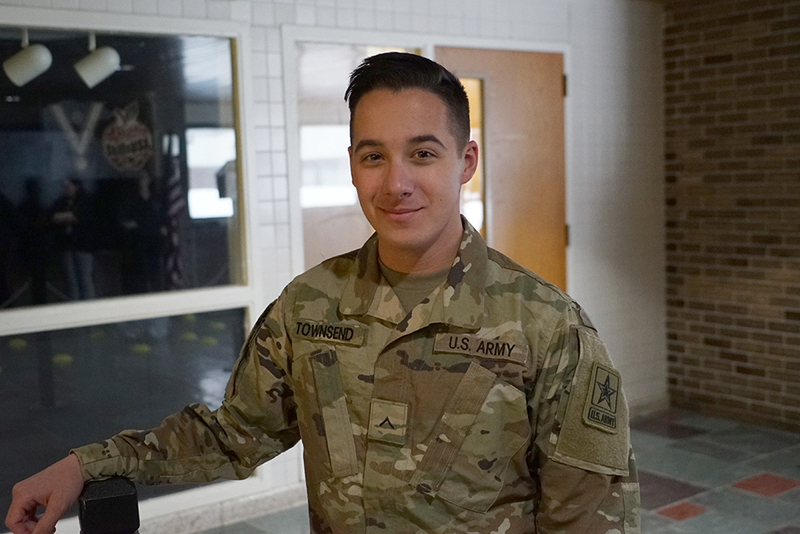 There are numerous career opportunities available for graduates of the Career & Technical Education program offered at Jefferson-Lewis BOCES, including the armed forces. That was the path taken by a recent graduate who plans on using his military service to help pay for college. Max Townsend is a 2018 graduate of Lyme Central School. During his two years at BOCES, he was enrolled in the Electronic and Computer Technology program at the Bohlen Technical Center. He has career aspirations to be in the IT field, but also wanted to find a way to help finance his future college plans. As a result, he decided to join the United States Army several months after graduating high school. Max had the opportunity to relay his recent experiences to current students as part of an Army recruiting trip to Bohlen Tech. in February. After enlisting in August, he spent several months in Basic Combat Training. From October to January, Max went through Advanced Individual Training and will soon be stationed at Ft. Hood, Texas serving as a mechanic. Max says his time at BOCES helped him focus on his IT aspirations, describing it as a great experience. He also credits his instructor, Audrey O’Shea, with helping him during his two years at BOCES. He plans on having dual majors of IT and Mechanics when he attends college. Interested in learning more about the Electronic & Computer Technology program offered at BOCES? Click here.